The Earls of Harrington, Elvaston Castle, Derbyshire. Christopher Gibbs, Esq., The Manor House, Clifton Hampden, Oxfordshire; sold Christie's house sale, 25-26 September 2000, lot 400. The Giant Deer (or 'Irish Elk') lived during the Pleistocene Period of the Great Ice Age. It probably originated in Siberia but migrated westward under the influence of increasing cold. Its range extended over a wide part of central Europe and Asia and the largest concentration of its remains have been found in Ireland, chiefly in the marl underlying bogland. This marl has a high calcium carbonate content, which assists in preserving bones. These ancient antlers, many discovered in caves in Counties Waterford, Cork and Clare, have long been a feature of the Irish banqueting hall. Among the most celebrated examples of the extinct Giant Deer were those displayed at Rathfarnham Castle in the 1580s (A sketch is preserved in the National Museum of Ireland and is illustrated in A. Crookshank and the Knight of Glin, Irish Watercolours, London, 1994, pl. 30). An early recorded example of the Irish giant deer or 'Elk' antlers, of the type found around Cos. Waterford, Cork and Clare, was those sent in 1597 to Hatfield House, Hertfordshire. 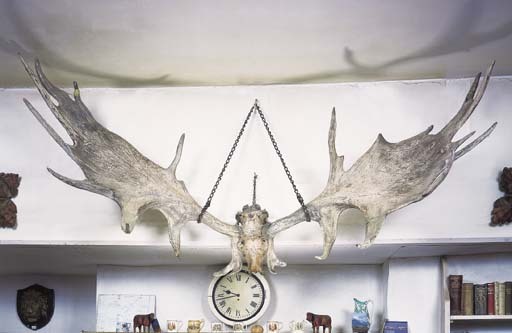 A related pair of 'Irish Elk' antlers, belonging originally to the Cobbe family of Newbridge, Co. Dublin, was sold anonymously, in these Rooms, 10 April 2003, lot 45 (£57,360).